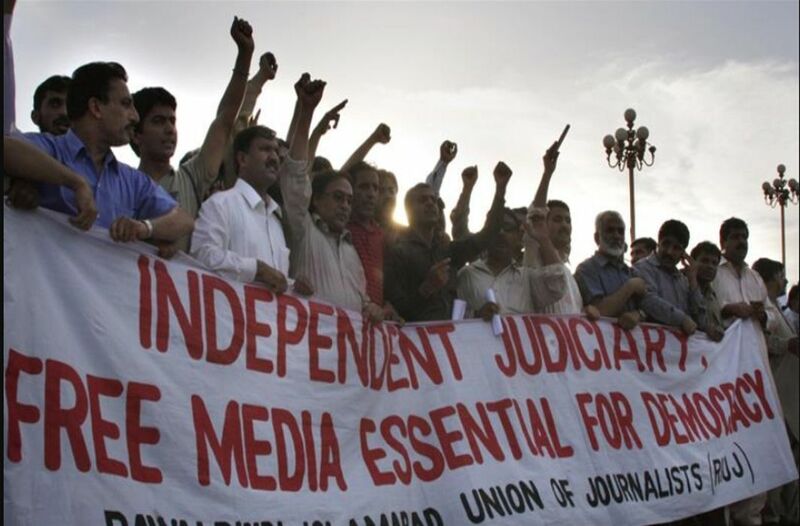 The Committee to Protect Journalist (CPJ), a New York based rights organization has alleged that the freedom of the press is under threat in Pakistan where its powerful military has used fear, intimidation, and even violence to push journalists into self-censorship. The non-profit organization having its reporters worldwide said on Wednesday that the Pakistani army has “quietly but effectively set restrictions on reporting” by establishing “lines of control” to gag the media. The report said that the strategy includes “barring access to regions … to encouraging self-censorship through direct and indirect methods of intimidation, including … allegedly instigating violence against reporters”. Reuters reports that while the army has not responded to the report, Pakistan’s Information Minister Fawad Chaudhry said the government has not received any complaints of intimidation from journalists. CPJ has reportedly spoken to journalists and media organizations, including Geo News, country’s most popular news channel, and the English-language newspaper Dawn. Referring to the recent government acts of intimidation during elections, the report said cable distributors had stopped distributing Geo’s programs to about 80 percent of households ahead of general elections. Aljazeera said that Reuters news agency reported at least two sources at Geo News said in April that the army asked them to refrain from reporting on alleged military involvement in the incarceration of former PM Nawaz Sharif. He was ousted from office in July by Pakistan’s Supreme Court. Similarly, the editor of Dawn said the circulation of the newspaper was blocked in several places at the behest of the military. “They’re clearly not happy with Dawn’s policies. They want Dawn to stay away from certain subjects,” its editor Zaffar Abbas said. The US based journalists’ rights group said a journalist was beaten in a brazen attack in Islamabad, while another was assaulted by members of the security forces in Karachi. The CPJ report has alleged that the army, intelligence service, or groups with ties with military were linked to half of the 22 journalists’ killings in the past decade in the country. However, currently the military has been applying indirect ways of intimidation. The CPJ report came at a time when newly elected Prime Minister Imran Khan has been appreciating army and received 8-hour long long briefing by Inter Services Intelligence on Wednesday. The general elections have triggered widespread allegations of the Pakistani army fixing the vote.